We have a free hand this particular month with Cake Slice Bakers September challenge as it is the last cake we would be baking from "Cake Keepers Cake by Laura Chattman". Save to say that there will definitely be a variety of recipes being blogged. Next month the Group will be revealing a new book, our third todate, to bake from for the next coming twelve months. Unfortunately I don't have a copy of "Cake Keepers Cakes" book and had to search the internet for whatever recipes that have been published from this book. 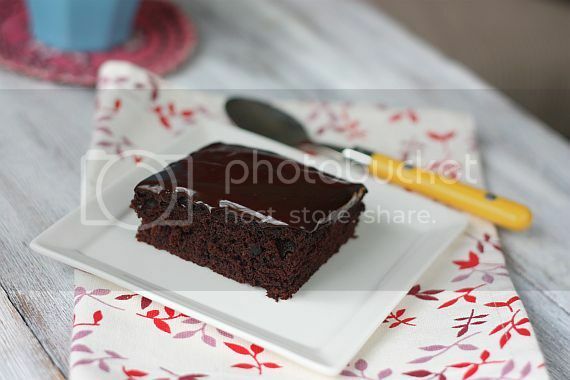 I came across a few and decided to bake a chocolate cake which uses stout. Actually using stout in a cake is not new to me as I had made Chocolate Guinness Cupcakes when I first started blogging. 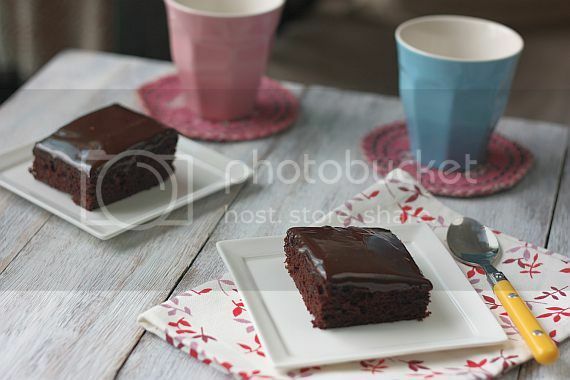 The stout really enhances the cocoa in this particular recipe and it gave the cake an intense chocolate colour. The glaze is simply to die for and I can only say that this is definitely a keepsake recipe and also no creaming is involved. What more could I ask for! 1) Preheat the oven to 350 degrees F. Grease an 8-inch square baking pan and dust it with flour, knocking out any extra. 2) Combine the stout and butter in a saucepan and bring to a bare simmer. Remove from the heat and whisk in the cocoa powder and cinnamon until smooth. Set aside to cool. 3) Combine the flour, brown sugar, baking soda, and salt in a large mixing bowl. With a wooden spoon or electric mixer, stir in the stout mixture, egg, and sour cream until just combined. It's okay if there are still a few lumps in the batter. 4) Scrape the batter into the prepared pan and smooth the top with a rubber spatula. Bake until a toothpick inserted in the center comes out clean, about 35 minutes. Set the pan on a wire rack and let the cake cool completely in the pan. 1) Combine the stout and corn syrup in a small, heavy saucepan and bring to a boil. Remove from the heat and whisk in the chocolate until shiny and smooth. Let cool to warm room temperature and spread the sauce over the top of the cake. Let stand until the sauce is set, about 1 hour. Cut the cake into squares and serve. 2) Store uneaten squares in a cake keeper or wrap in plastic and store at room temperature for up to 3 days. Oh My! This looks amazing...! I have a can of stout sitting on my fridge for some time now...and I have being dying to try this cake... trouble is... DH stopped drinking now! Your cake looks delicious indeed. I have never 'dare' to use Stout in my baking or cooking in dishes. Just wondering how does this cakes taste like. Still I believe is delicious! The cake looks like very tempting & yummy! Hi Edith, Ann, Mel, DG and BB, do try this out and I guarantee you will have no regrets. Emily, tell DH that the alcohol would have evaporated already once you put it on the stove. Furthermore you really don't smell the stout in the cake at all. You should really try out the recipe. Yummy yum yum! Cheers to all Chocoholic! Looks fascinating!Love how dark brown and bright it is! Never used stout in a cake and didn't know that it makes the color stronger. Thanks for informing. Yum!! This looks so rich! Saw these guys on Foodgawker and wow! Your photos are stunning. I've had a stout chocolate cake before and loved the combo, the glaze on this one puts it over the top! Nicely done! The snacking cake looks stunning with the stout glaze! Thanks for stopping by. I loved your blog. I am sure I will spending more time here. 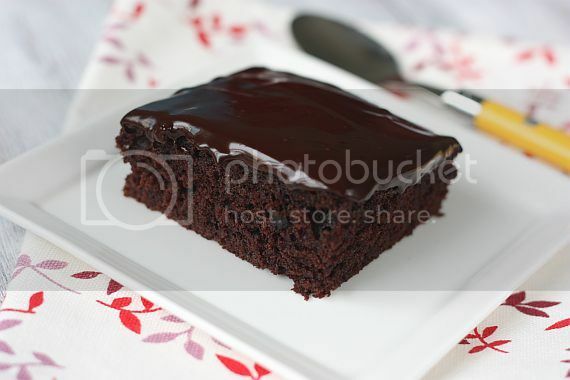 How can you go wrong with a delicious piece of chocolate cake. Looks wonderful! That chocolate cake really melted my heart away...yummy. This one is my favorite and it looks very tempting...ammmmmm..... i want to enjoy music with my travel ipod speakers while eating this. Music Balloon Speakers not only make a rocking hipster accessory for your iPod, but also lets you listen to music on the go with out distracting headphones as a travel iPod speakers.